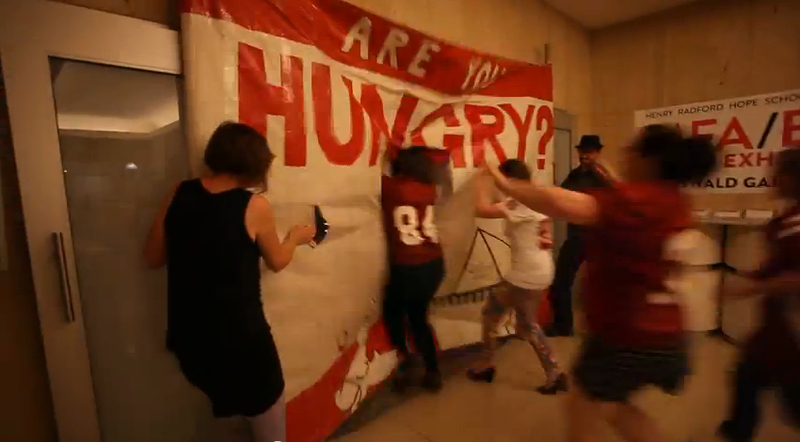 “Are You Hungry?” was a performance as part of my ceramics MFA Thesis Exhibition, “A Temporary Victory”. This footage by Kevin Mooney. At every game of Australian Rules Football, giant banners are used to celebrate a team’s entrance into the field. Behind the scenes, fans traditionally craft these, using cheap materials and taking many hours to demonstrate their love of their football club. The banners are destroyed in seconds as the players burst through them onto the field. I admire the banner-making, the selfless ritual act of creative devotion. Sometimes there are endearing misspellings, or the banners fail to break, which results in the players getting stuck in the crepe paper and tape. I made a banner to show a correlation between my admiration for my artist friends as a team throughout graduate school and the football fan’s admiration for their dedicated sports team. All the graduating Masters of Fine Arts from 2014 were asked to arrive early to the exhibition opening on 24th April at Grunwald Gallery and run through the banner together to open the gallery wearing IU football jerseys to symbolise teamwork. This banner will acted as a celebratory event to acknowledge the achievement of graduates of Fine Art. The banner has words I have absorbed from mentors during my time at Indiana University, specifically the question “Are You Hungry? !” asked by Malcolm Mobutu-Smith in my first critique at Indiana University.